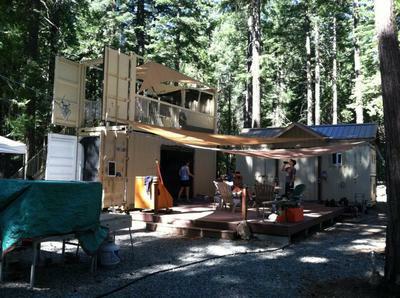 Shipping Container cabins as a second home. All solar electric, build with items from Ebay and Craigslist. Containers are terrific BUT there are a few precautions. These shipping containers are VERY strong when designed, but incorporate a UNI-BODY construction. What that means is that the walls, top are all one-piece and when left intact, they have incredible structural integrity. But many people cut out walls, windows, etc. and this severely diminshes the strength. NEVER stack a container on top of another without some structure for supporting the top container. NEVER stack one on top of the other without this because the bottom could crush and I have seen this happen often. I have been selling iso shipping containers for many years and have a direct connection to China and stock over 5000 containers here in the US in most major cities.